Hopefully this will help any Microlight or GA pilots out there who want to record their flights with crisp clear audio direct from the cockpit intercom system. There are a number of solutions around, but most are quite bulky, and, frankly somewhat more expensive that the hudred and thirty odd quid that this lot came to. The main difficulty is in finding a camera system that has external microphone inputs – this alone usually precludes any of the consumer level equipment, so you are left with buying devices that cost over £200. 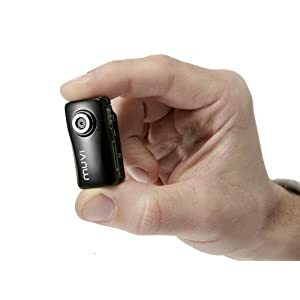 For quite some time I have been recording my flights using a Veho VCC-004-ATOM Muvi Atom Super Micro DV Camcorder (you can buy these from amazon quite cheaply). It’s a tiny little thing I stick to the side of my Dave Clarks with a homemade bracket and some gaffer tape – not the most elegant of solutions, as you can see, but it is easily removable! It can record for around an hour and a half on a warm day, but if you land away then it’s easily recharged using a Power Traveller Power Monkey and you’re ready to go again. The lead seems to be made from high quality cable, and should take cockpit life and being thrown into and pulled out of your flight bag in it’s stride. I use a Sony ICD-PX820 Digital Voice Recorder with Flash 2 GB and MP3, again from Amazon to record the audio. I’m actually quite surprised by the quality of the audio from the recorder – I’m sure the signal levels are a bit hit and miss, so I was expecting it to be either very quite or very distorted, but in fact it’s pretty good – perhaps only very slightly overdriven. The plug must have some impedance matching circuitry built in. The really nice thing about this whole setup is that you also get th main cockpit raw noise (from the Muvi), plus the intercom audio, so you have some options when putting it all together in your video editing software of choice. Do I need to run AntiVirus on my Mac?